I considered going to the Cleveland International Film Festival this year, I really did, for a moment or so. But I didn't. In truth, going downtown is a downer for me in the best of times. Too many bad memories. And I don't like to gamble, I don't like to see sports, mug people or get mugged. So the metropolis holds little appeal for me. On an optimistic note, the Cleveland International Film Festival in 2015 managed to branch out into satellite theaters, one of them deep in the suburbs, at the the Cinemark Valley View, where I feel slightly more likely to come out alive. I hope that trend continues, and the thriving Cleveland International Film Festival eventually migrates out of Cleveland altogether. Most likely, based on past history, going all the way to Miami-South Beach, Florida. Where there is likely more parking and less snow. Where I'm even less likely to attend. Damn. Oh well, home video allows you to create! Your own! Cleveland International Film Festival! At! Home! 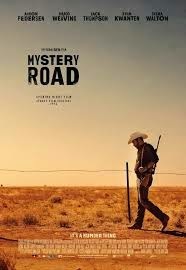 You may as well start with Australian writer-director Ivan Sen's MYSTERY ROAD. The filmmaker's laconic, racially-tinged police thriller is stranded somewhere between the mythic and merely moody. But its ominous, stripped-down narrative still commands attention with its sense of place and foreboding. In a corner of the Australian Outback known as Massacre Creek, rookie police detective Jay Swan (Aaron Pederson), of aboriginal descent, goes to work on the laid-back local force. He patrols a region where he grew up - and left behind a daughter and an irresponsible ex-lover a decade before - in the torpid native settlement. When the corpse of an aboriginal teenager is found by the roadside showing signs of addiction and brutalization, Swan learns the insular community has been haunted by the shadow of drugs, disappearances and rumors of child prostitution/victimization by outsiders, likely Australia's many long-haul truck drivers, who can come and go and leave no evidence. Swan finds his fellow officers curiously unconcerned about the crimes, in which his own wayward daughter may be somehow involved. Sen uses the wide skies, blazing sunsets and horizons of the Bush the way the Coen Brothers did with the wintery landscapes of FARGO to set a regional flavor and environment of menace and incipient danger, one that finally (if puzzlingly) pays off in a violent finale. Australian thespians Hugo Weaving and Bruce Spence take supporting roles. Disc extras include cast/filmmaker interviews, and one should note Sen's contention that, no, you didn't miss something, the final scene is supposed to be an open ending that leaves characters themselves shruggingly wondering what happens next (and don't count on the "mystery" being solved in any traditional Hollywood fashion).